UPVC, CPVC, Bakelite's, Formed Plastics, HDPE, LDPE, PP, Acrylic, etc. 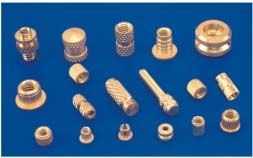 Molding Brass Inserts as per Customer's designs / Sample can be produced . CVPC Moulding Inserts Rubber Moulding Inserts Plastic Moulding Inserts are with ISO METRIC,BSW, BSP, BSPT, UNC, UNF, NPT, NPS etc in Jamnagar india .